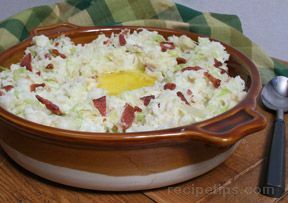 A potato and cabbage or kale side dish from Ireland that is typically served during festivals, holidays and various seasonal feasts such as Imbolc, the first day of spring or end of the Celtic year known as Samhain or Hallowe'en. Traditional ingredients for Colcannon include potatoes, kale or cabbage, onions, butter, salt and pepper. 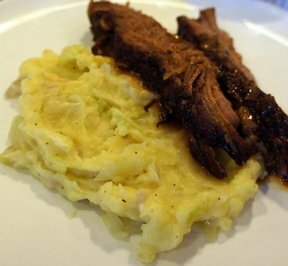 Milk may be added if the mashed potato mixture is too firm and stiff. 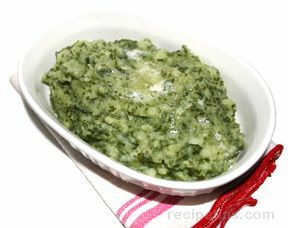 Kale is most common when Colcannon is served during Hallowe'en while green cabbage is often used during winter months and spring. The ingredients are pan fried until crisp and browned on the top to add a texture to the creamy potato mixture.